Capacities from 800 to 15,000 pounds. Dual Purpose - Use on floors or on tracks. 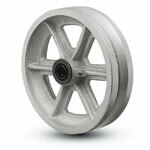 Lubrication - Wheels with 1-3/16" hub length are lubricated through a hollow axle. When specified, zerk fittings will be furnished at an additional cost. All other wheels listed have zerk fittings.